Emberlight is proud to be sole agent for Kromalaser performance Laser Harps in the Asia and Pacific regions. Presenting the ONLY complete range of adaptive and self-contained performance instruments of their kind on the planet that will suit every budget. 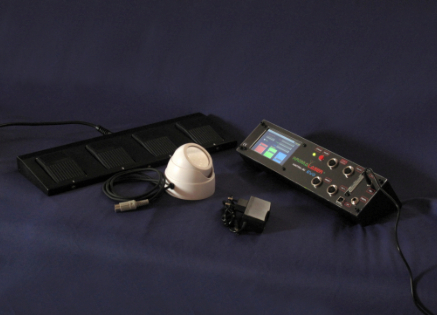 Plug the 3D EVO Controller into your favorite MIDI sound device and Laser Projector. Within seconds you will be up and running with the most visually stunning, responsive 15 note polyphonic controller available. From Little Boots performing in her living room to Jean Michel Jarre playing a stadium in China there is a system to suit. For specific information on Laser Projectors click here. All programming is performed with the inbuilt LCD TOUCH SCREEN. External UltraSENSOR™ (unaffected by ambient light). Set up can be done with PC software and stored within the Evo for a virtually infinite number of programmable presets. All functions are assignable and can be triggered using the LCD touch screen. The firmware is up-gradable via PC software. Footswitch, ILDA & USB cable included. * RGB Laser projector required (sold separately). Gain Control - Digital and Manual. MIDI - MIDI Out/In and USB Polyphonic. Power Supply - 110 & 240V 50/60Hz. Scan Frequency - From 5 up to 70Hz. Analog Pedal In - 1 Input 1/4" Phono. Pedal 1 - Octave down. Pedal 2 - Octave up. Pedal 3 - Shift 1 semitone up. Pedal 4 - Shift 1 semitone down. Assignable Functions by Touch Screen. 5 up to 15 Beams. 2D and 3D laser harps are generated and programmed (3D Patterns Project the Beams Around the performer, 2D Patterns Project the Beam in the traditional fan shape). Programmable beam pattern width as well as Z-Position (3D). Programmable power of each colour. Colors for Diatonic/Chromatic notes assignable to R,G,B values. Triggered note can change color. Auto-color mode and Curtain mode for special effects. EmberLight can provide expert advise, solutions and support on the right Laser Projector for your Laser Harp, next big show outdoors, or simply to impress your friends at home...safely. You can find out more about our Lasers here. Copyright Emberlight Pro-Creative Tools - SpaceStar Ordering Ltd 2014 All rights reserved.